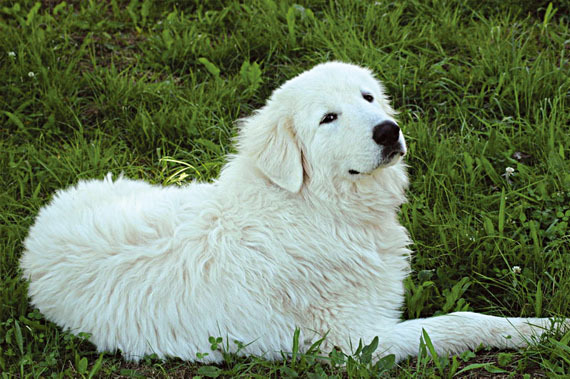 Belongs to the stock of big white dogs from Central Europe, ancient stock of flock keeper characterised by a combative and wary temperament. This kind of dogs arrived in Italy from the Middle East. 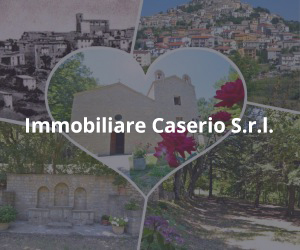 Nowadays are diffused in an quite big area, from Grosseto province in Lazio to the South of Umbria, in Abruzzo, along the coasts of Molise and in the North of Puglia. Abruzzo sheepdogs used to be highly appreciated by the shepherds because they were very resistant against the attacks of wolves, in fact they still being used against wolves. 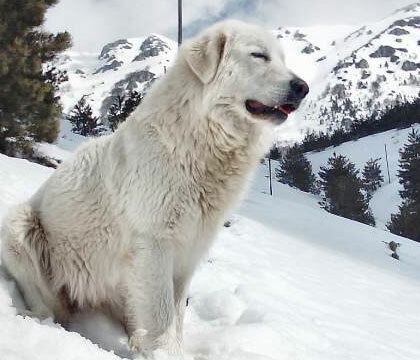 A current WWF project aims to assign to shepherds very well trained dogs, in order to be protected against wolves in a fairest way and in order to prevent a violent and brutal hunt of these endangered species. The tail is low and goes over the hock. The tail is always kept low, it is erected parallel to the back only when the dog is in a state of alert or excitement. 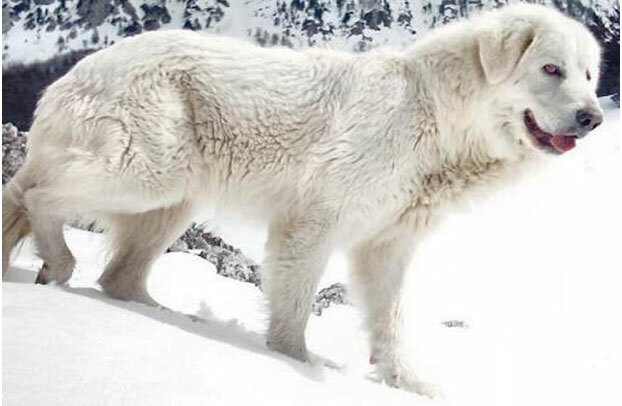 Its coat is totally white, only few and light shades of ivory or pale orange are allowed. The coat is abundant, long and coarse, sometime can be slightly waved. During winter the undercoat is thick. Eyes are brown or ochre, almond shaped and not big compared to the head. Hears are high and “V” shaped. The head is big and flat, with a conic shape, reminding to the head of polar bears, skull is wide. 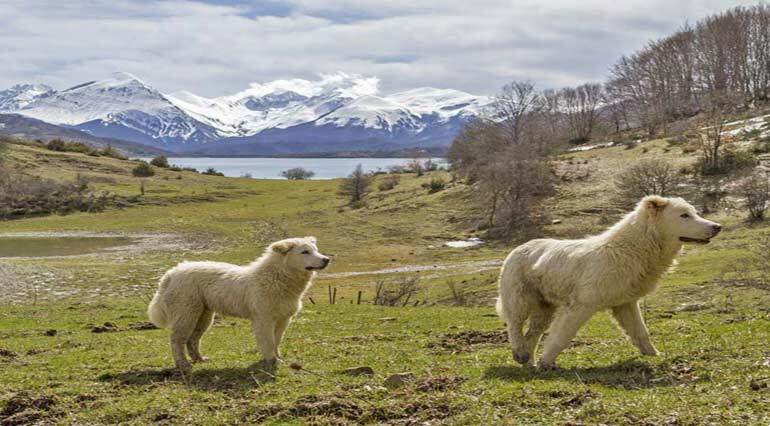 The weight of Abruzzese sheepdog should oscillate between 30 and 45 kg, but usually its over 55kg for males and 45kg for females. This dog is very proud, dignified and full of strength, has a strong and independent temperament. Often is defined as being similar to a feline. Is bound to his owner by a strong affection but he wants to be respected in order to give back respect. Is distrustful with foreigners, but he normally becomes aggressive only if necessary. Abruzzo sheepdog is not too fussy about food. In the past its diet was very frugal, this has been toughened his character. Normally he needs 600gr of meat a day, although food requirements can differ according to circumstances; in fact a working dog needs more food than a dog that lives a sedentary life. 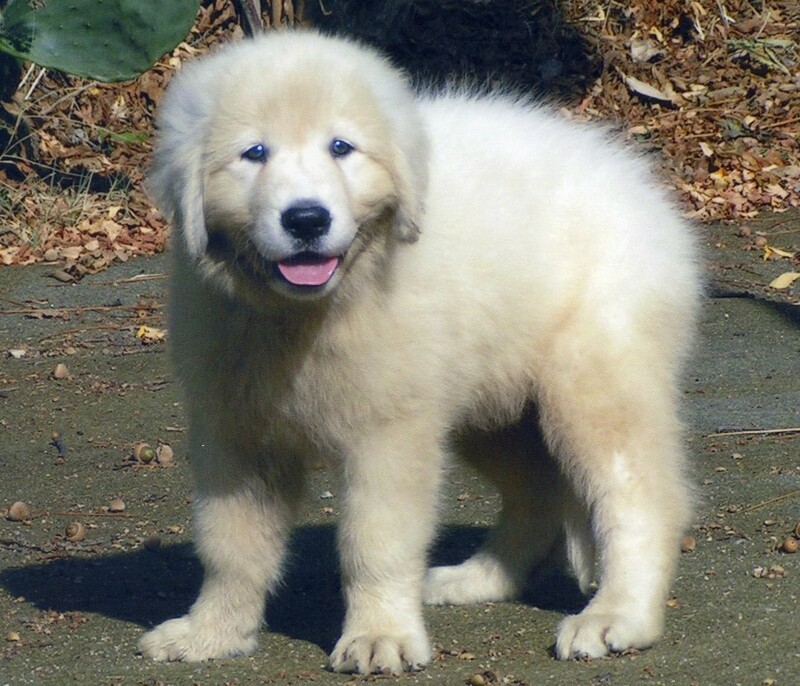 A poor diet is better for these dogs, because their stomach is subject to torsion when overfeed, this disease can provoke death especially in oversize subjects. To avoid these problems, is advisable to divide the daily ration of food in two or three smaller portions. Female with puppies can be feed up to 4 kg of meat a day. These dogs have been feed for generation with what the shepherds could provide for them, usually whey, dried old bread, waste of meat. It is normally thought that is better feed the dogs with boiled meat instead than row meat, in order to sterilise the meat and also in order to avoid that the dog can become aggressive and attach other pets. But the truth is that row meat has some benefits, in fact when boiled loses its vitamins and part of its nutritional power. Furthermore dogs’ stomachs can easily digest row meat or other kind of food that is highly indigested for humans. Recent researches have proved that dogs feed with the BARF method (Biologically Appropriate Raw Food), are less afflicted by dysplasia. It is not always true that bones can’t be given to dogs; bones are rich in calcium and are especially indicated for puppies because they can grow up to 300gr a day and they need plenty of calcium. Bones are also good for teeth, because they help to eliminate residual of foods that in the long run can provoke caries. Fragments of bones can be dangerous for the stomach and the digestive system, but only long bones, especially of turkeys and rabbits. In the past, when these dogs used to live with shepherds their diet was very poor, based on whey and dried old bread, but this food was scarce during certain periods of the year, so the dogs were used to feed themselves hunting small rodents, lizards or even crickets.